Stan Verrett to Host College Football Saturdays on ABC - ESPN Press Room U.S.
Stan Verrett will host college football Saturdays on ABC this fall, filling the role of the late John Saunders who had held the position on ABC’s college football studio set since 1992. “John Saunders was a mentor and friend who helped me navigate my career at ESPN and was always ready with a kind word and timely advice,” said Verrett. “His easy manner and comfortable style welcomed college football fans every week for years on ESPN and ABC. He was a fantastic host. Verrett, who has worked for ESPN since 2000 and most notably anchors the 1 a.m. ET edition of SportsCenter from Los Angeles, will work alongside college football analysts Mack Brown and Mark May for pre and postgame, as well as halftime wraps. ABC college football studio coverage will continue to air out of ESPN’s headquarters in Bristol, Conn.
ESPN has hired Miami Hurricane National Champion, Super Bowl Champion and three-time Pro Bowler Jonathan Vilma as a college football studio analyst. Vilma will be reunited with his former Hurricane head coach and current ESPN college football analyst Butch Davis on Saturdays on ESPN2 with Chris Cotter hosting during pre and postgame, as well as halftime wraps. Prior to being hired at ESPN, Vilma was a college football studio analyst for NBC Sports (2015) and an NFL studio analyst for NBC Sports Network and Bleacher Report (2014). Dating back to his college football career, Vilma was the middle linebacker on the 2001 Hurricanes National Championship team, leading the team in tackles that season. Vilma was a first round pick in the 2004 NFL Draft by the New York Jets and was awarded the AP NFL Defensive Rookie of the Year. The Coral Gables native would be named to the Pro Bowl three times and win Super Bowl XLIV with the New Orleans Saints during his NFL career before retiring in 2014. For the second consecutive year, college football analysts Joey Galloway and Danny Kanell, with Adnan Virk hosting, will be on ESPN for pre and postgame, as well as halftime wraps this fall. Additionally, this season, the trio will work College Football Final at the conclusion of each Saturday’s game action. ESPN will have a studio presence in Austin, Texas, for No. 10 Notre Dame at Texas (Sunday, Sept. 4 at 7:30 p.m. on ABC) and Orlando, Fla. for No. 11 Ole Miss vs. No. 4 Florida State (Monday, Sept. 5 at 8 p.m. on ESPN). Mack Brown will make his return to Austin, where he was the head coach of the 2005 National Champion Texas Longhorns. Brown will be joined by Desmond Howard, David Pollack and Rece Davis on location for College Football Countdown from 4 p.m. to 6 p.m. The show will be from the concourse level of Darrell K. Royal-Texas Memorial Stadium. The five-day, best college football kickoff week concludes on Labor Day in Orlando. 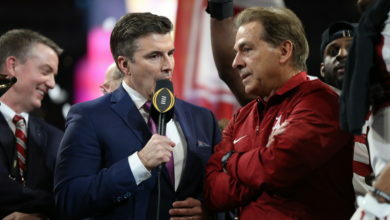 Rece Davis, Howard and Pollack will once again be onsite for College Football Countdown from 7 p.m. to 8 p.m. The show will be from the concourse level of Camping World Stadium. The studio presence in Austin and Orlando is in addition to previously announced sets at Lambeau Field in Green Bay, Wisc. for College GameDay Built by The Home Depot and in Knoxville, Tenn. and College Station, Texas for SEC Nation on Thursday and Saturday, respectively. The newly-revamped College Football Live continues each day at 1:30 p.m. throughout the season. In October, the network will return College Football Playoff-centric programming, including Championship Drive: Who’s In. Starting October 9, the Sunday studio show will review each weekend’s games and dive into the playoff debate in a 30-minute show format (regularly at 1 p.m.). A rotating cast of analysts will appear including Butch Davis, Heather Dinich, May and Vilma. Cotter will host. ESPN will once again have the College Football Playoff: Top 25 show this season, with details announced soon. ESPNU will feature Jason Fitz of Grammy-nominated The Band Perry, along with Mike Golic Jr. and Elika Sadeghi on CFB Daily each Monday. Complete details on ESPNU’s entire programming schedule are here. Longhorn Network returns Texas dedicated football programming, including Rewind with Charlie Strong, an exclusive weekly sit-down with host Lowell Galindo and Coach Strong breaking down the most recent game from the Longhorn Network studios. Complete programming details here.